ESD-Safe Tapes and Label Materials | Polyonics Corp.
Electrostatic discharge (ESD) can occur when static charge is released, in the form of electrical current, into an ESD sensitive (ESDS) device. If the charge exceeds the specified threshold of the device, it can cause immediate or latent damage. There are many sources of ESD, but increased attention is being given to the role of induced charges arising from process-required insulators—including labels and tapes. The ANSI/ESD S20.20, its international equivalent IEC 61340, and the JEDEC JESD625B standards define the ESD control plan required for an ESD protected area (EPA). All three standards provide guidance relative to packaging requirements, including process-required insulators such as labels and tapes, when used in the proximity of ESDS devices. The S20.20 and 61340 specify accumulated voltages on labels and tapes be less than 125 volts when used within 1” and 2000 volts within 12” of ESDS devices while JESD625B specifies 250 volts within 1” and 1000 volts within 12”. In addition, all three standards (including S541 within S20.20) offer surface resistance specifications within the traditional >104 and <1011 Ohms static dissipative range. Polyonics has developed a family of ESD-Safe polyimide and polyester (PET) labels, tapes, tags and films that comply with the S20.20, IEC 61340 and JESD625B standards and are safe to use in ESD control plans. The materials have static dissipative top surfaces and low charging pressure sensitive adhesives (PSA) and liners that generate less than 125 volts with liner removal and again if repositioned or removed post process. The materials have proven to help designers and manufacturers protect their most sensitive ESDS devices from electrostatic charges arising from both human contact (HBM) and charged devices (CDM) and have become valuable elements in the successful ESD control plans of global electronics EMS’, ODMs, converters and OEMs. Polyonics has worked with leading ESD expert, consultants within the electronics community and S20.20, 61340 and JED625B standards committees to develop a comprehensive white paper. 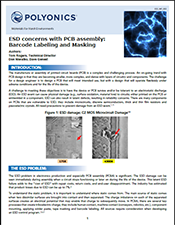 The paper defines the ESD problem, describes the test standards, and offers guidance on how to best reduce ESD risks associated with using process required insulators around static sensitive devices. The paper and supporting third party data are available as downloads from this page. Polyonics has recently expanded its line of high temperature tapes with new products, features and capabilities. This includes new masking, bonding, vapor barrier and high opacity options plus expanded ESD protection, broader temperature ranges and improved adhesives. Polyonics ESD labels and masking tapes provide both static dissipative and low charging performances that comply with the ANSI/ESD S20.20 requirements for process required insulators. With surface resistances of greater than 104 and less than 1011 Ohms and accumulated charges of ‹125V they have proven to be effective tools in reducing electrostatic discharge in S20.20 control plans.